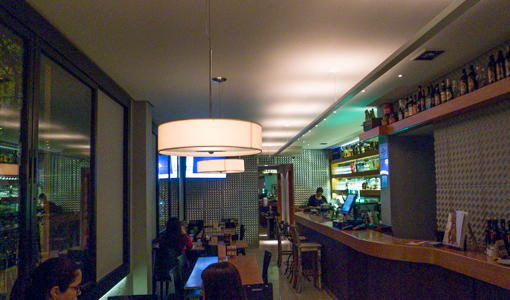 Dgé is a neighborhood gastropub/burger joint on Al. 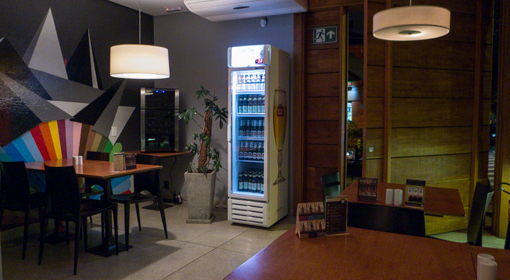 Campinas, 1021, in Jardim Paulista – about 10 minutes walk from my second hotel which is located downtown (near the junction of Pamplona and Jai). 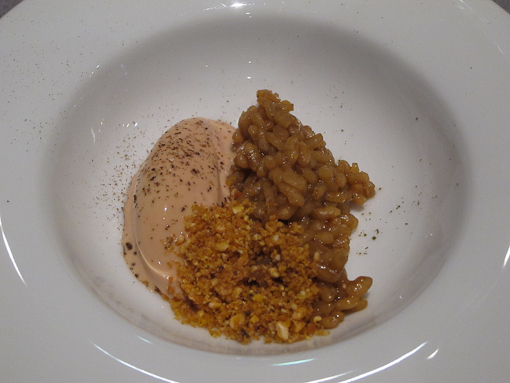 While there are a few street-corner lanchonete (diners), they did not look particularly appealing. So I was happy to find Dgé on my first night in the area. I was hungry and it was getting late. 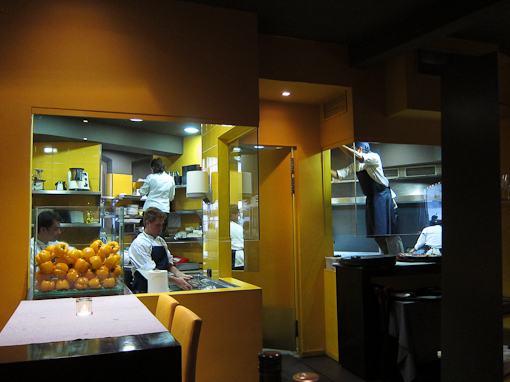 Friendly staff (no English), a few patrons – not crowded but not too quiet. Relatively simple menu (some English), fair prices. 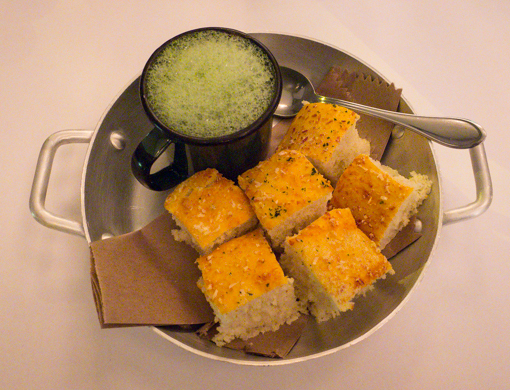 Started with a traditional black bean soup (Caldinho de Feijao preto) and cheesey bread. 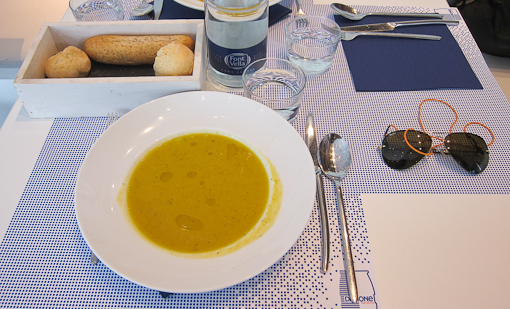 Soup was great. 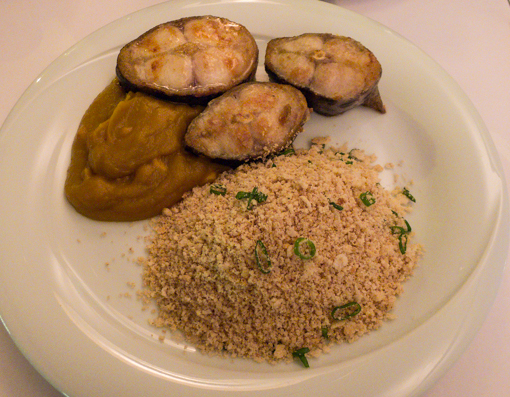 After days of beef à la churrascarias, Filet de Pintado (Grilled river catfish filet with mashed pumpkin and cashew nuts, biju flour) sounded good. 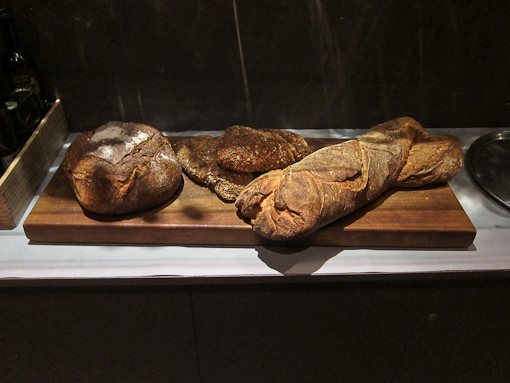 It came as a dish of muddy brown colors, unlike the soup and bread. This was just average. 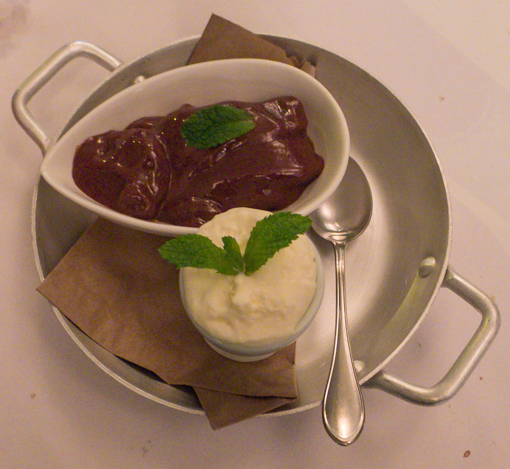 Brigadeiro de Colher (sweet condensed milk with chocolate, Cupuaçu fruit chantilly) – the condensed milk part is traditional. Very tasty. It was a Wednesday night so the place was relatively quiet after 9pm. It has a open air terrace for drinks on the first floor above street level. Highly recommendable if you are in the neighborhood. I (Chris) was back in New York for a business trip. This is first time I spent a whole weekend there since we moved two years ago. The meeting ended with the beginning of the memorial day weekend and I was happy to see many good friends over several meals. 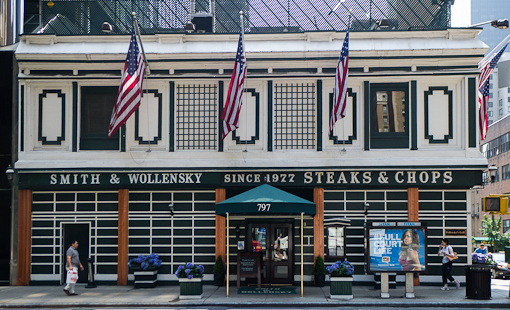 With my colleagues, we had a steak dinner at Smith & Wollensky. On Facebook, I put out a message to all my friends, asking if any one can meet me in NY. 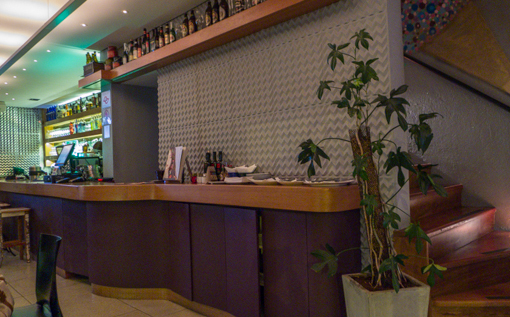 After the drinks, we went next door to a Turkish restaurant that we visited a while back – Sip Sak. 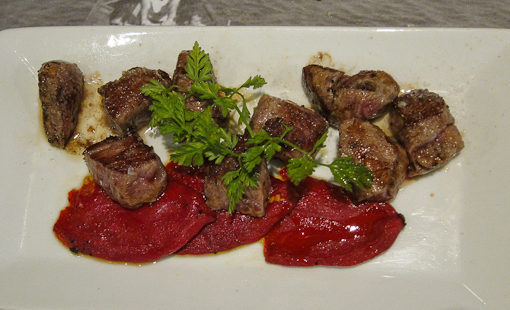 I had a lamb shish kebab – the meat was very tender but under-spiced. 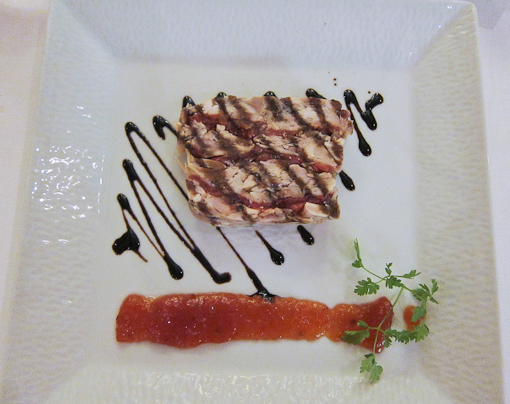 The maitre d’ was a character and quite rude to us (and other customers). He seemed offended when we did not order the specials and shared a dish. 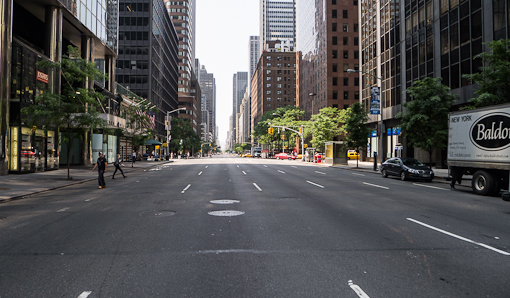 On Saturday, midtown Third Ave (around 50th street) was empty. All the New Yorkers have left town for the long weekend. 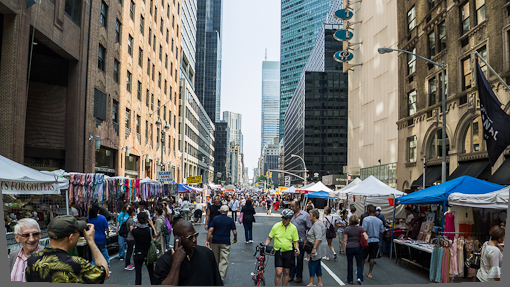 The residents left the city to the tourists who were enjoying the street market that took over Lexington Avenue. 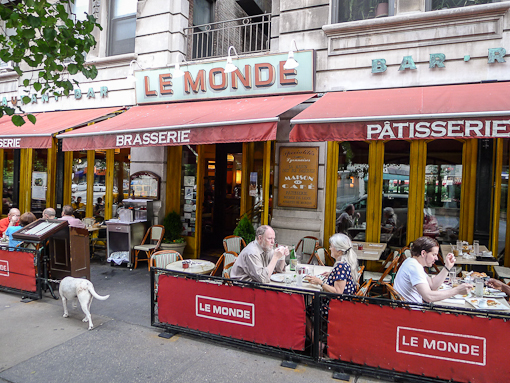 I met G and Sh for lunch uptown at Le Monde near Columbia University. It was a very hot day so we sat inside the bistro. 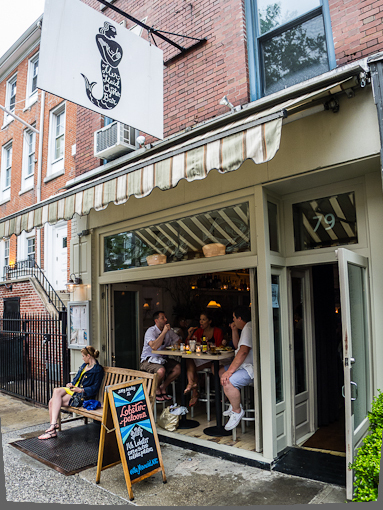 Later, I met Se and O at the Mermaid Oyster Bar on MacDougal near Houston – a branch of the Mermaid Inn. We were early enough to take advantage of their famous seafood happy hour – east coast and west coast oysters – half a dozen each. 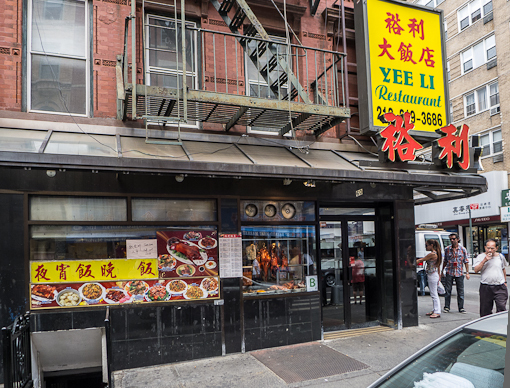 On Sunday, I was in Chinatown but did not go to my usual place as it was too crowded so I had lunch at this other noodle shop. 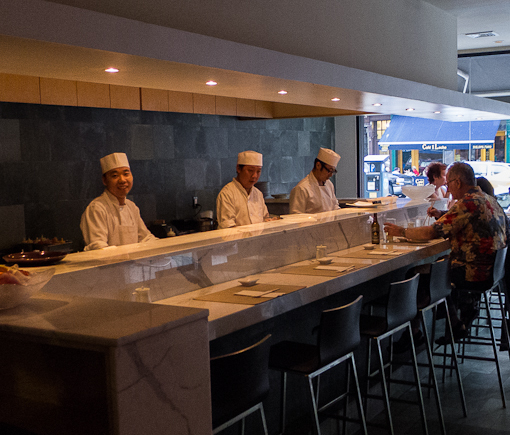 I joined Y and So (plus a few of So’s friends) to see Jiro Dreams of Sushi at Symphony Space on the Upper West Side. 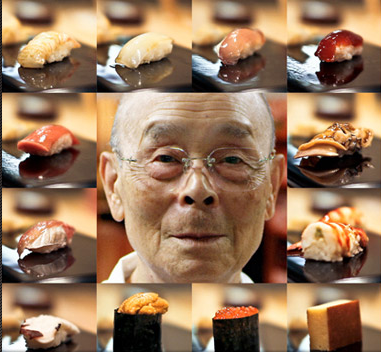 JIRO DREAMS OF SUSHI is the story of 85 year-old Jiro Ono, considered by many to be the world’s greatest sushi chef. He is the proprietor of Sukiyabashi Jiro, a 10-seat, sushi-only restaurant inauspiciously located in a Tokyo subway station. 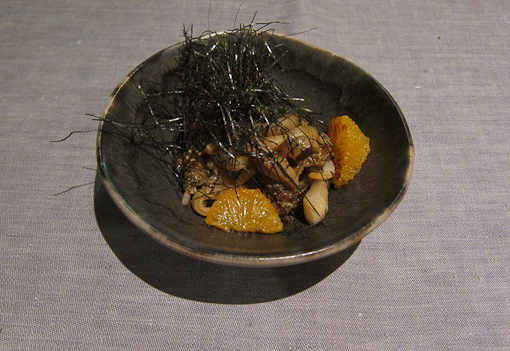 Despite its humble appearances, it is the first restaurant of its kind to be awarded a prestigious 3 star Michelin review, and sushi lovers from around the globe make repeated pilgrimage, calling months in advance and shelling out top dollar for a coveted seat at Jiro’s sushi bar. 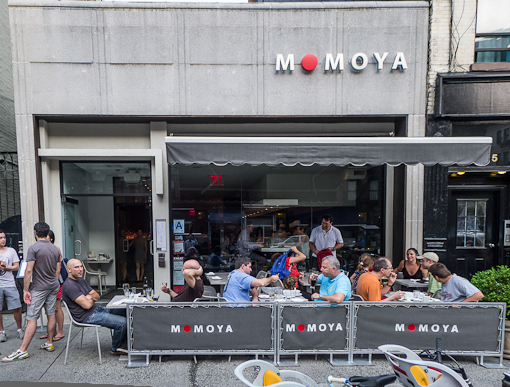 I thoroughly enjoyed the movie and have to thank So’s thoughtfulness for booking us all a table for dinner at Momoya after the movie. 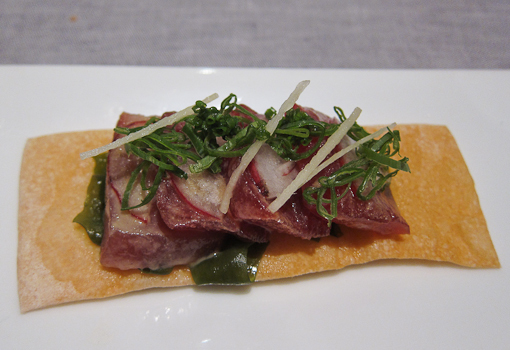 Although Momoya’s sushi cannot be compared with those of Sukiyabashi Jiro, it was nevertheless satisfying. I had a great weekend, thank you – and especially Y for the accommodation. For regular folks like us, the time to do shopping is mostly the weekend. But when all of us are shopping at the same time at the same places, the result is crowds and stress which strip away all sense of fun. While on vacation, we visited a suburban mall in Southern California (Los Angeles county) on a weekday and it was a real pleasure to browse and shop leisurely. No groups of people clogging up the aisles, and you have the full attention of the assistants. 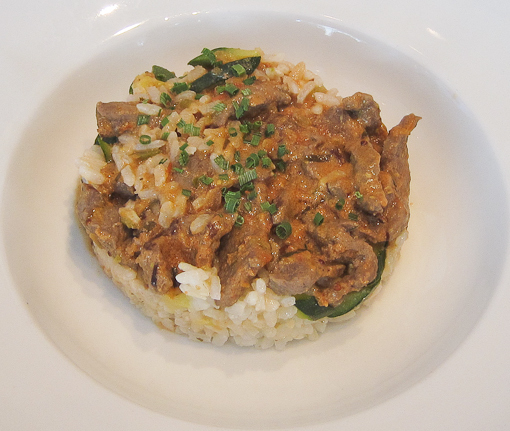 And when it is lunch time, we wandered off to a restaurant in the mall (no lines !). 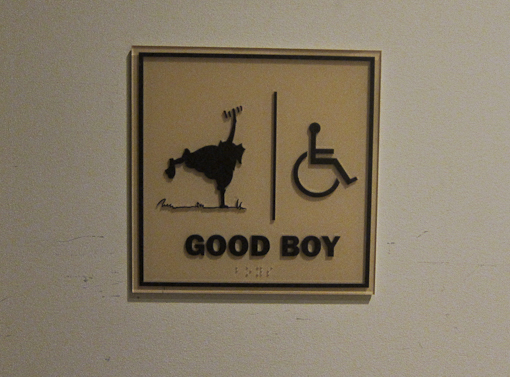 This mall restaurant uses man’s best friend as the theme. 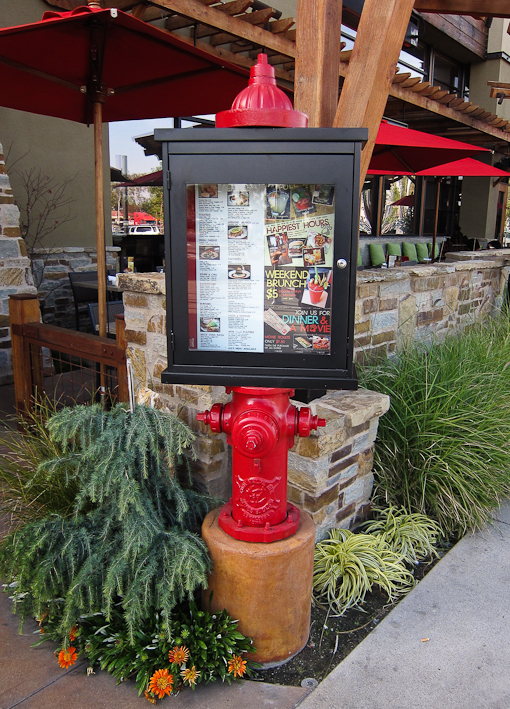 Next to the entrance of Lazy Dog Cafe is the menu framed by a fire hydrant. 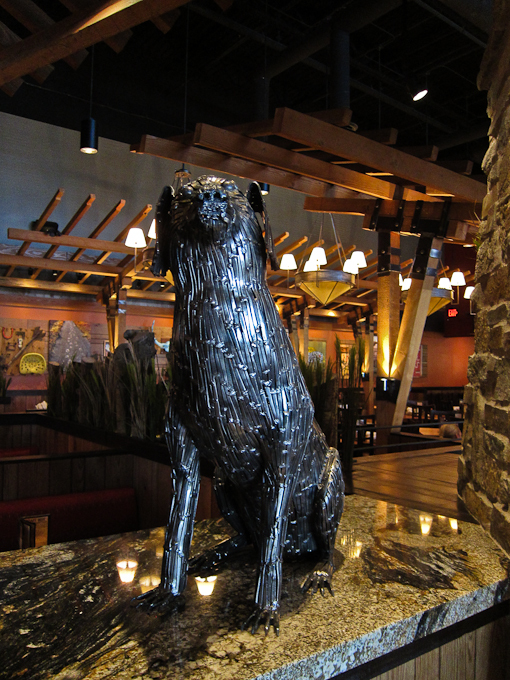 Lazy Dog Cafe is a mini chain of restaurants, all of them located in Southern California. 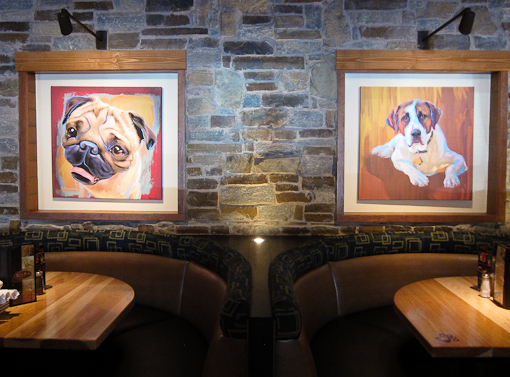 Small-town hospitality is their secret sauce and the name was inspired by the sight of a lazy dog lying by a fire in a ski lodge (according to their website). 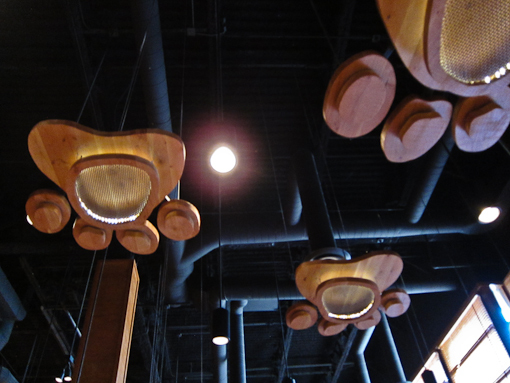 Suspended from the ceiling are giant dog paws (diffused light fixtures) that “walk” you to the bar area. Sue really liked their chicken sandwich and is a repeat customer. I had a fish taco. 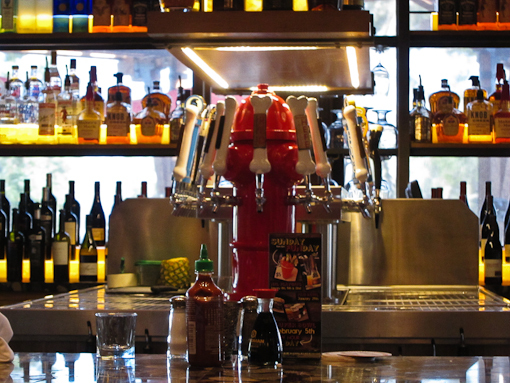 Bone-shaped bar tap. Notice the Kikkoman soy sauce and Sriracha chili sauce – not commonly found on the counter (at least not on the east coast). This place can turn into a sports bar at night. 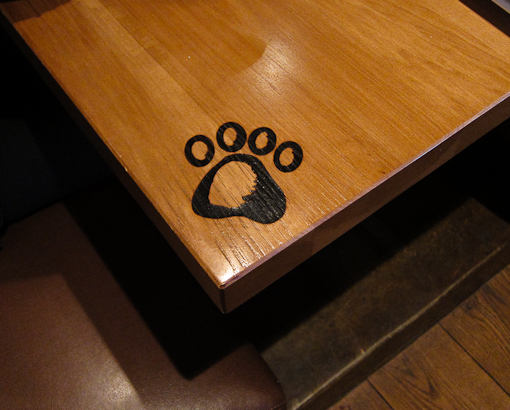 Paw print on each table. A new variant of the gender sign on the toilet door. In case of doubt, the word “boy” makes sure that it is understood. Another whimsical dog-themed light fixture. Notice the high ceiling and stone interior. 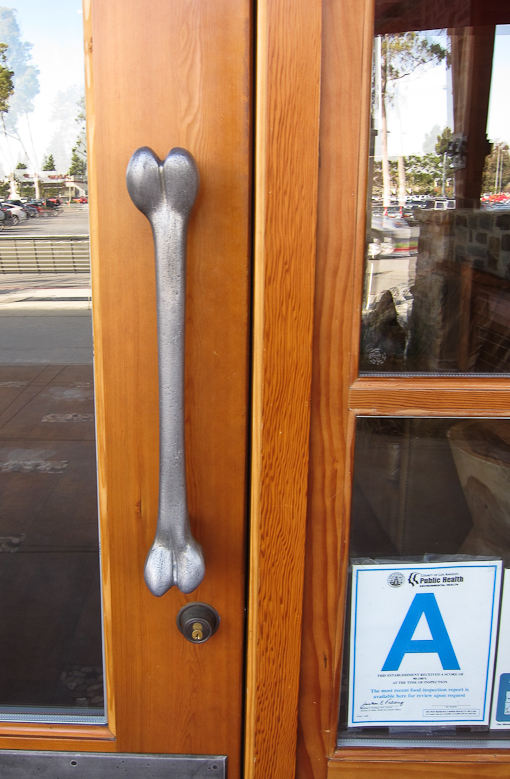 Finally, a bone-shaped door handle. 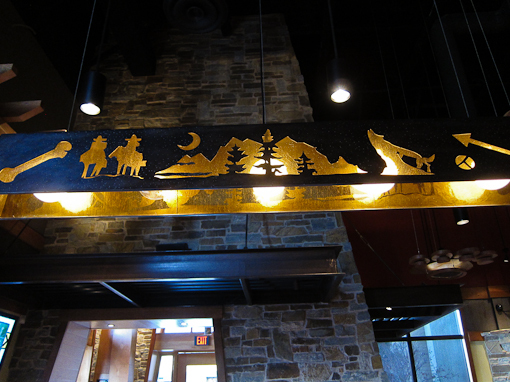 All in all, the Lazy Dog Cafe is a very pleasant eatery (and grade A cleanliness according to California Public Health authority). I wonder if there is a cat-themed restaurant some where. 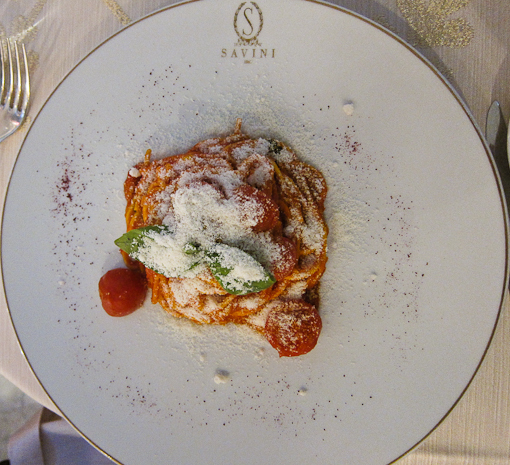 This type of restaurant, which serves mid-priced every day food in a spacious relaxing dining room, unfortunately does not exist in Switzerland. 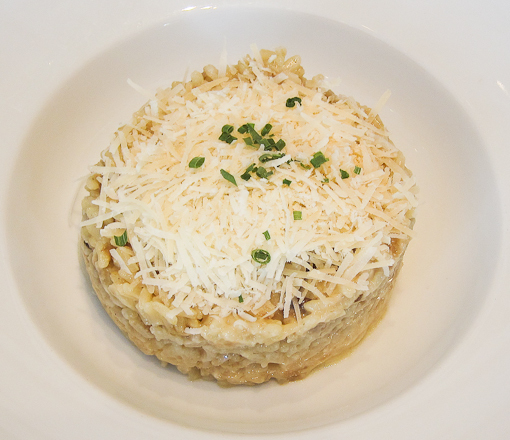 Another restaurant – Stacked – just opened in the same mall. On their menu is this item: “Kung Fusion” – Brioche Bun / Certified Angus Beef/ Cucumber / Wasabi Mayo / Sriracha Mayo/ Pickled Ginger Slaw. Love to try it. 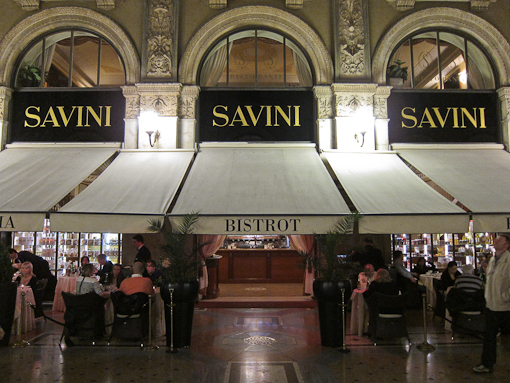 Our second touristy meal in Milano was a dinner at Savini. 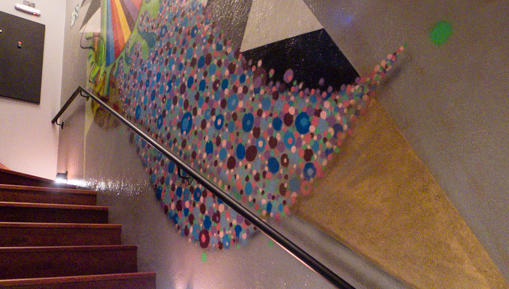 The restaurant is inside the Galleria and shares a corner in the middle with Louis Vuitton. It also happens to be directly across from a McDonald (see earlier post about Al Mercante). 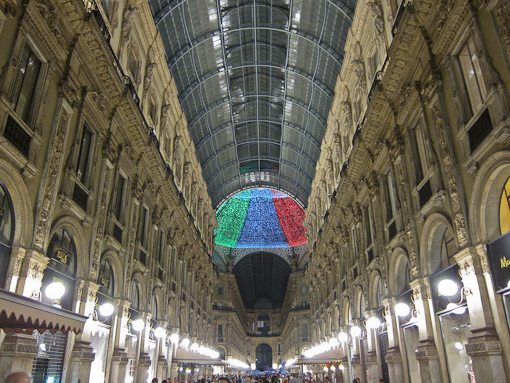 The Galleria was very much alive with people so it was fun to have dinner in the arcade and watch the shoppers. 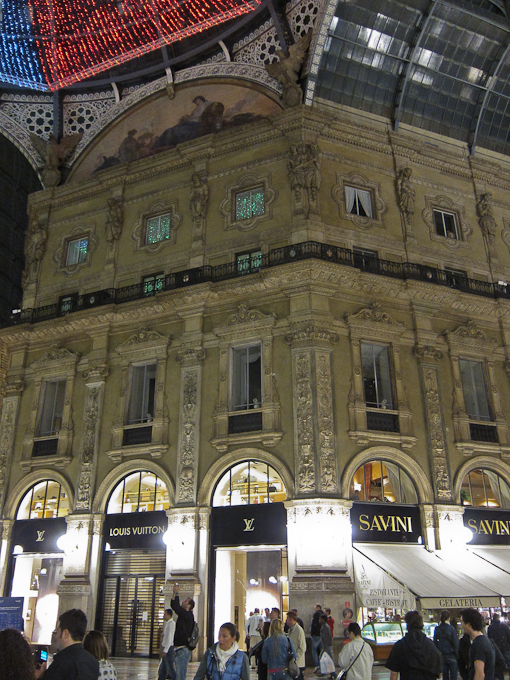 This place is used by both tourists and Milanese. The Galleria was beautifully lit. Not sure why they put that red, blue and green lights. Kind of destroyed the ambiance. We chose a table in the back row away from the velvet rope. 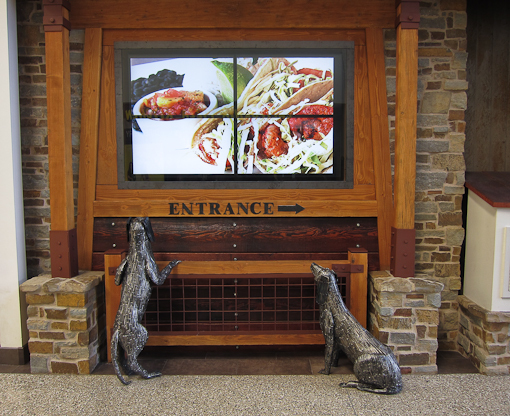 The service was good and it was entertaining to watch the maitre’d going up to cajole shopping-fatigued diners to come inside while they were inspecting the menu. 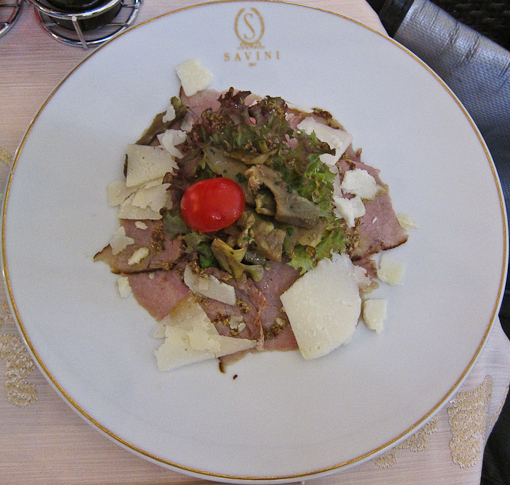 The restaurant has a gelateria, a cafe & pastry section, a produce shop (Savini Gusto) and a tasting room for their branded produce (big enough for a busload of tourists, downstairs). The romantic ambiance of the dining room on the mezzanine level and a view of the arcade behind huge glass windows is special. Every one chose to sit outside in the arcade. 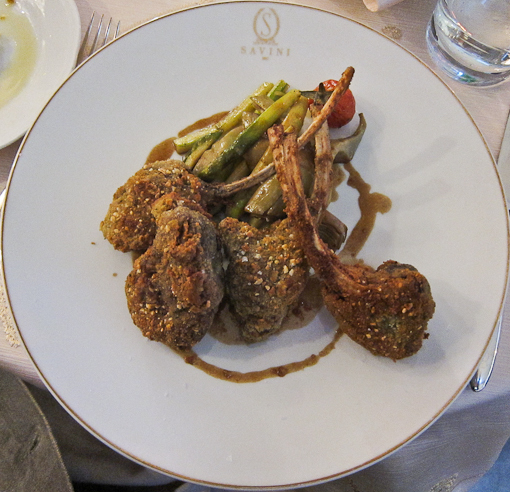 While the surroundings were lively and the service attentive, the food was relatively underwhelming – it was carefully prepared and tasted alright – not very exiciting. However, the olive oil was quite tasty so we bought a bottle – apparently one of five varieties they carry under their label. 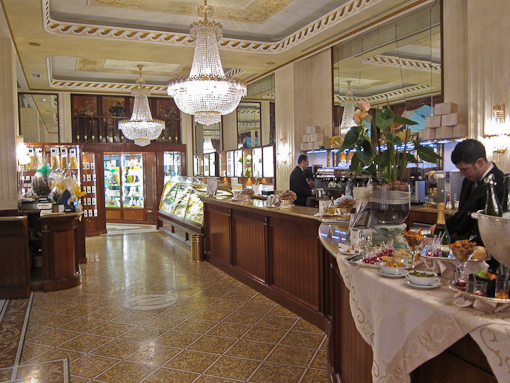 A perfect place for a light meal, an espresso or a dessert in the middle of every thing. 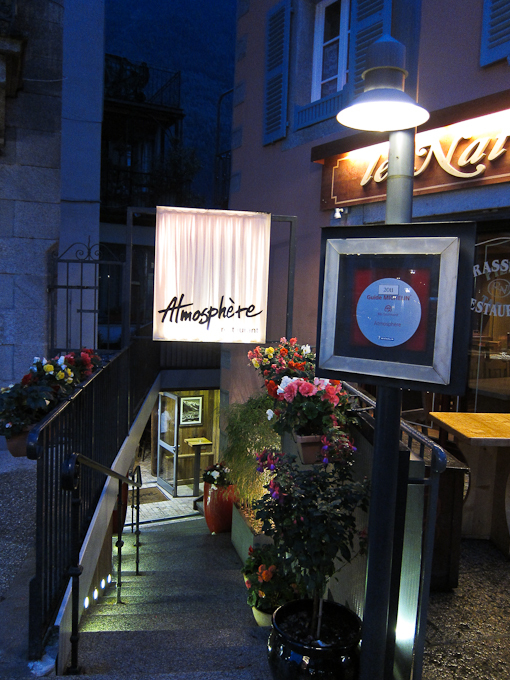 Atmosphère is mentioned under Bib Gourmand in the 2011 Michelin Guide. 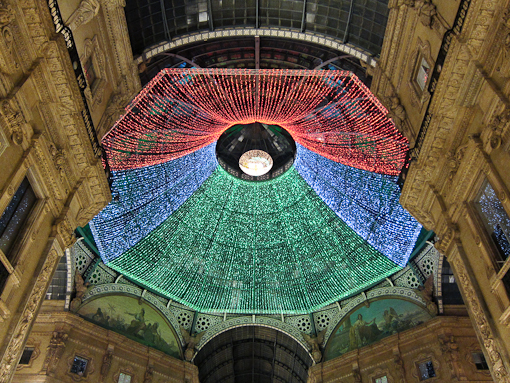 It is located in the “basement” of a building which faces the main city square. The “basement” has on the other side a waterfront view of the river Arve. We arrived without a reservation and were glad they seated us. I heard English spoken somewhere in the dining room and there was a Japanese couple. 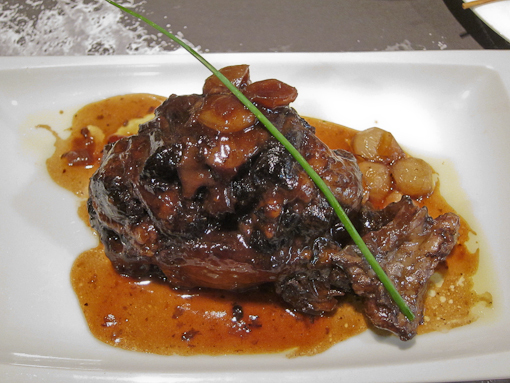 Then, a party of at least 20 French people (not local) came to celebrate a birthday. I believe it is not a foreign tourist trap. 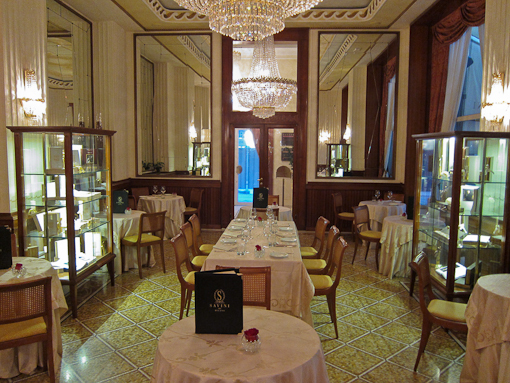 We really enjoyed our evening meal there and recommend it. Agreeably priced. Not fancy but solid continental fare. 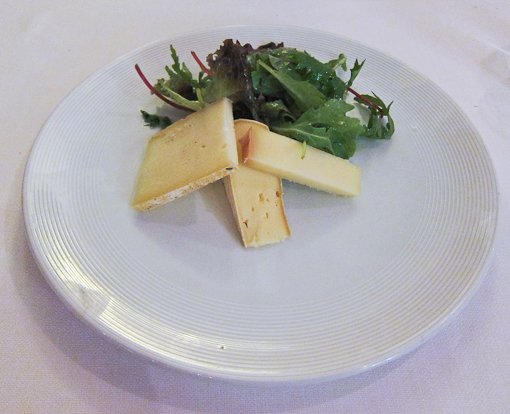 Three cheeses and salad (Beaufort, Reblochon, but I cannot remember the third) at the end. 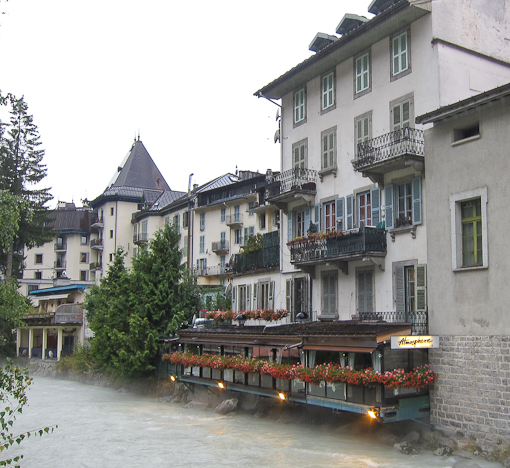 The restaurant is located next to the River Arve, just above the surface of the water. Must be nice during the day. 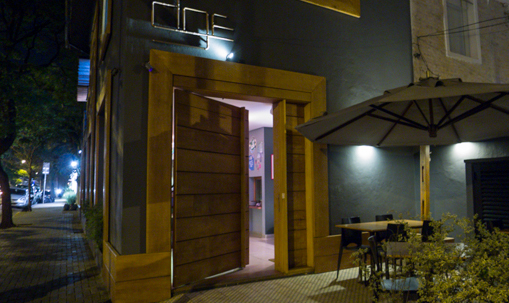 Comerç 24 – a chic restaurant at a hip location – as some publications described this place. Friends and colleagues recommended this place too. We managed only a reservation for lunch. 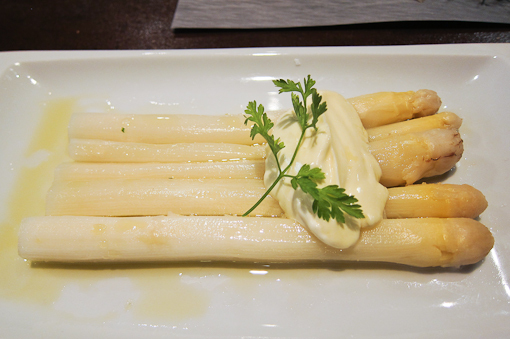 This place and several other “24” restaurants in the chain in Barcelona are very popular with tourists and locals alike. 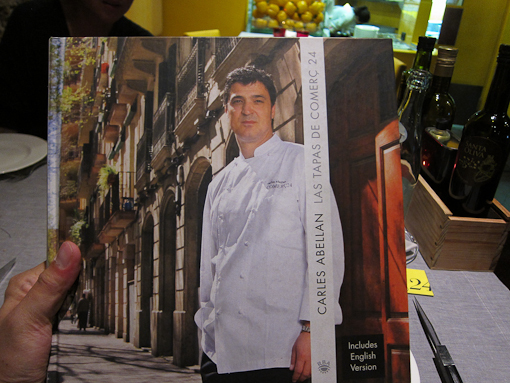 I believe this is where the “24” empire started – the name of the restaurant is its address, i.e., Carrer del Comerç No. 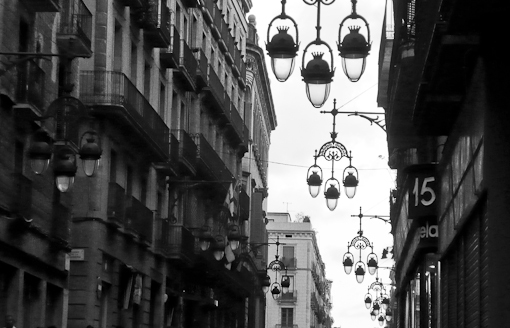 24, in El Born. 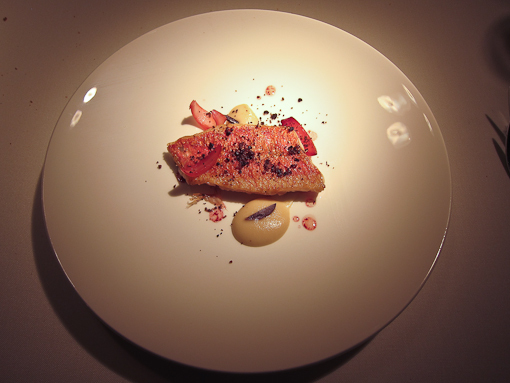 The chef – Carles Abellan – was a protege of Ferran Adria at El Bulli (just closed at the end of July 2011). According to a book about him and his food that was lying around in the restaurant (an autobiography I assume), he wanted to be a rockstar. 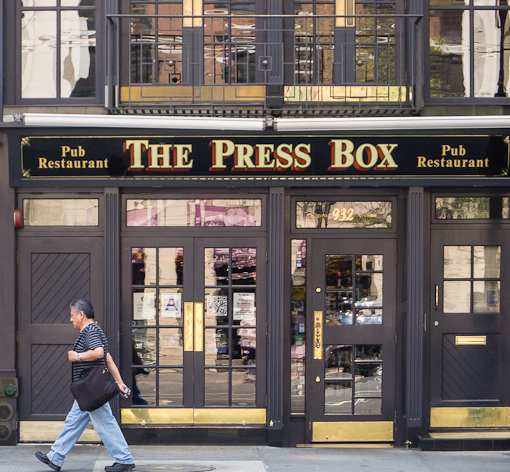 After many struggles and false starts, the story ends with him serving dinner to Mick Jagger during his Rolling Stone tour. Although the restaurant is all at street level, it is all artificially lit (can’t tell day from night inside), a bit like a club. 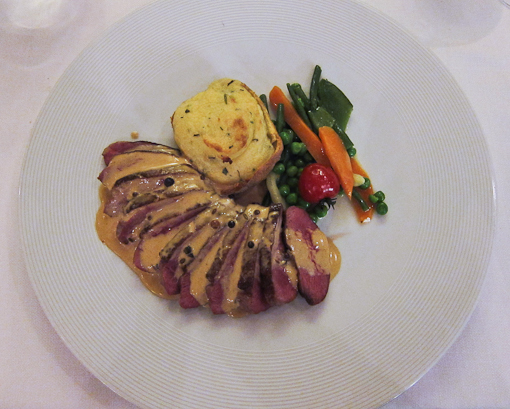 We did not order from their set menu, instead we ordered à la carte. 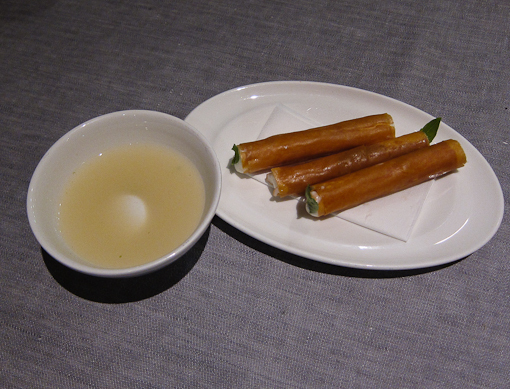 This is a freebie appetizer but it was really tasty – it is a “cigar” with crisp spring roll skin with a basil leaflet at the end and soft fillings – the soup was also excellent. 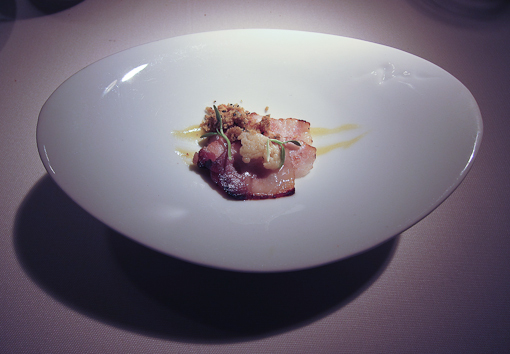 There are many asian-influenced tapas at the creative or high-end restaurants in Barcelona. 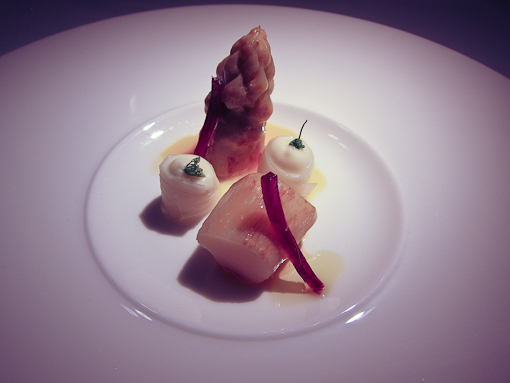 Alkimia (the other restaurant we visited with a tasting menu) had a few Chinese-style dishes. 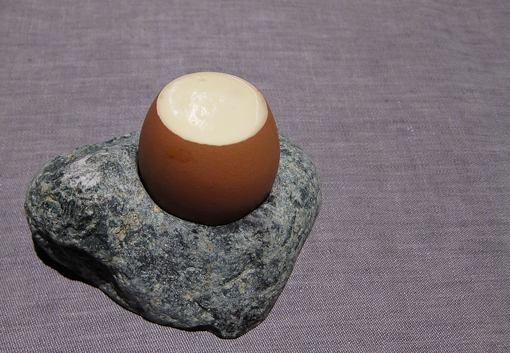 This is their specialty – egg shell filled with custard-like stuff that was truly full of flavors. The staff cleaned the kitchen top to bottom after serving lunch – a truly dynamic kitchen as we witnessed all the frantic activities from prep to serve, and then scrub. 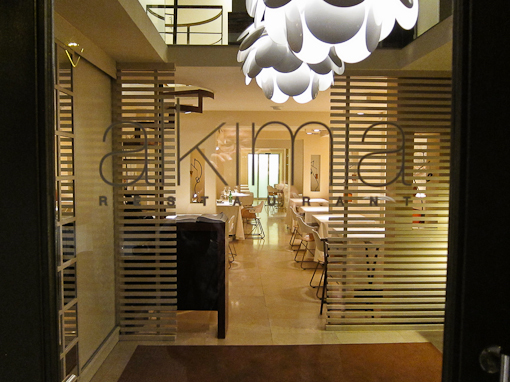 Alkimia – one michelin star. 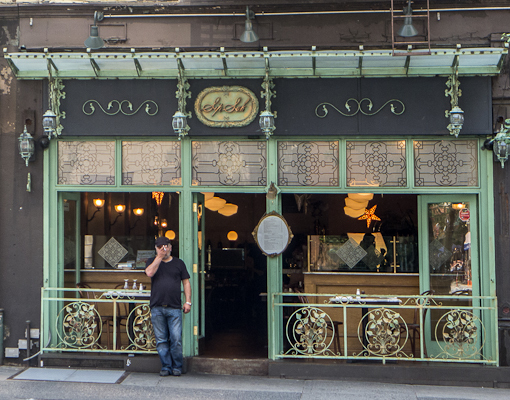 The name of the restaurant comes from the Arabic word “al-kimia” (the art). 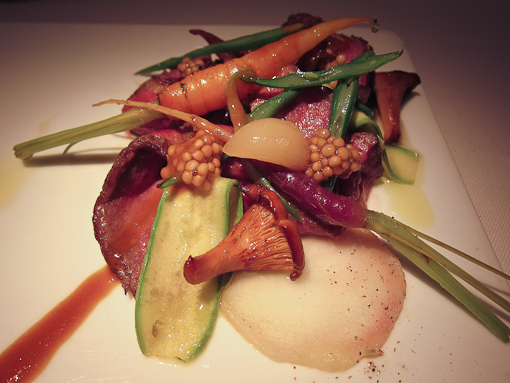 We arrived at 8:45pm, 15 minutes after our reservation, having misjudged the distance from Vinçon. 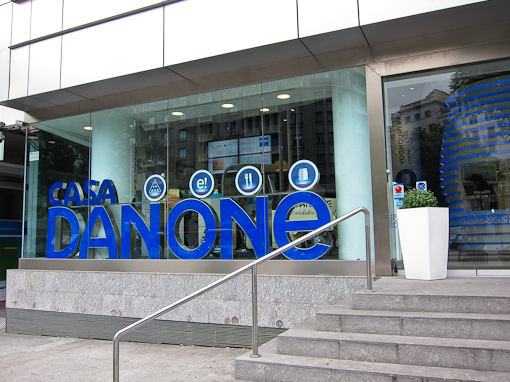 Alkimia is located “midtown” in Barcelona. 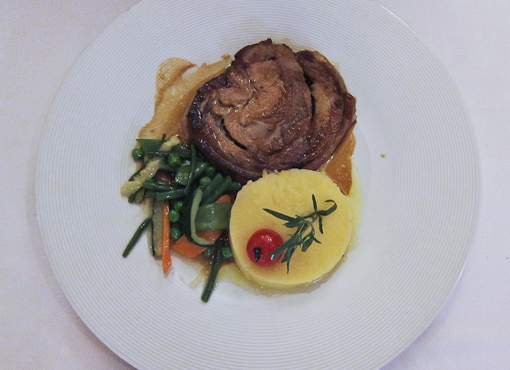 So we were a bit out of breathe but the serene atmosphere and warm towels helped put us in the mood for a gastronomic experience. 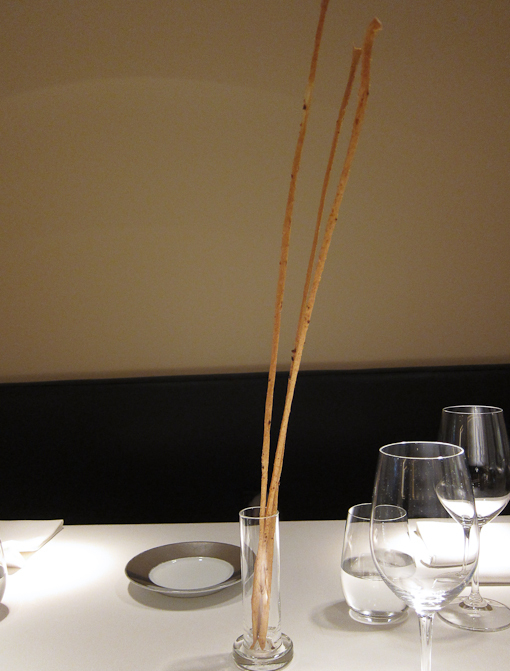 The homemade bread sticks came as two long sticks resembling twigs in a vase. 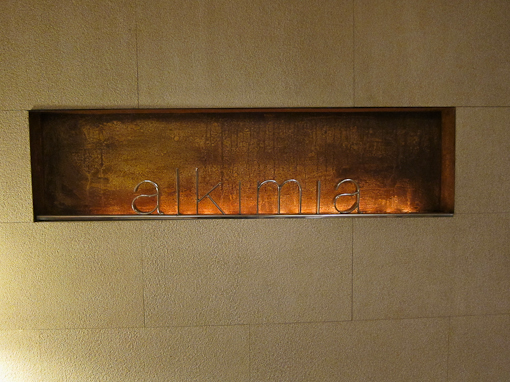 We chose the menu Alkimia – their namesake tasting menu. The lighting in the restaurant was awful for photos. Color balance is a disaster, so please bear with me. 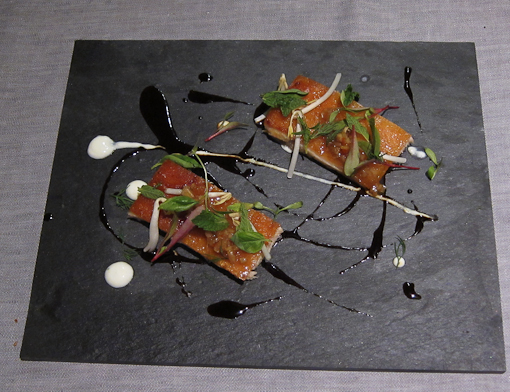 Below is a sample of the dishes. 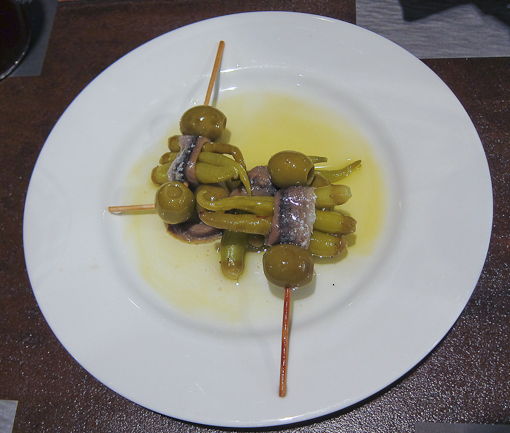 They started with three appetizers – all good but could not remember what they were at the end of the meal. This is not on the menu but every one in the restaurant got a plate. 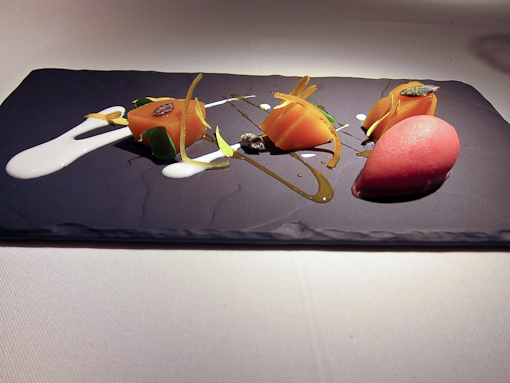 My overall impression, which was reinforced by a visit to another popular restaurant, is that the cuisine in this international city is at currently all about Asian flavors. I enjoyed the taste but to me, it lacked novelty. 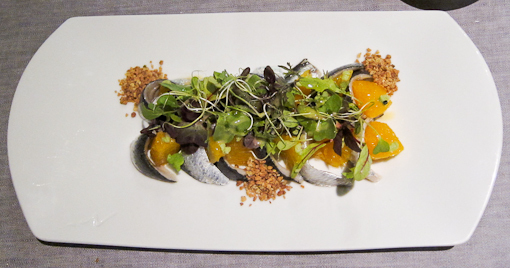 Nevertheless, Alkimia is definitely worth a visit. 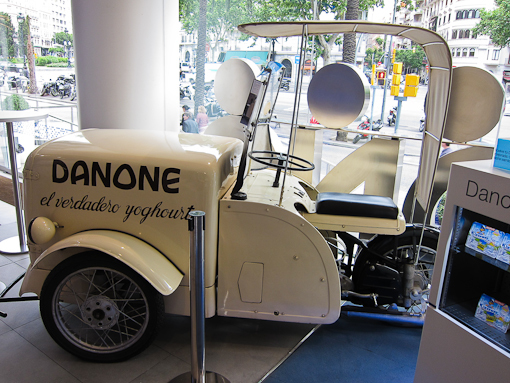 Danone – the French yoghurt giant – runs a restaurant ! Actimel, Activia … their brands. 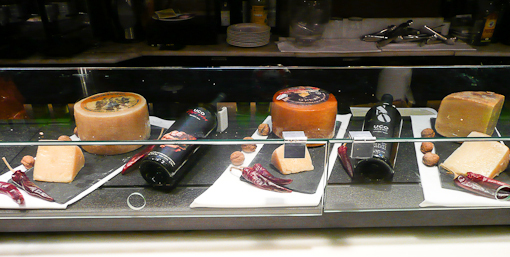 We were looking for a place for lunch in a business area of Barcelona (Av. Diagonal near Pl. 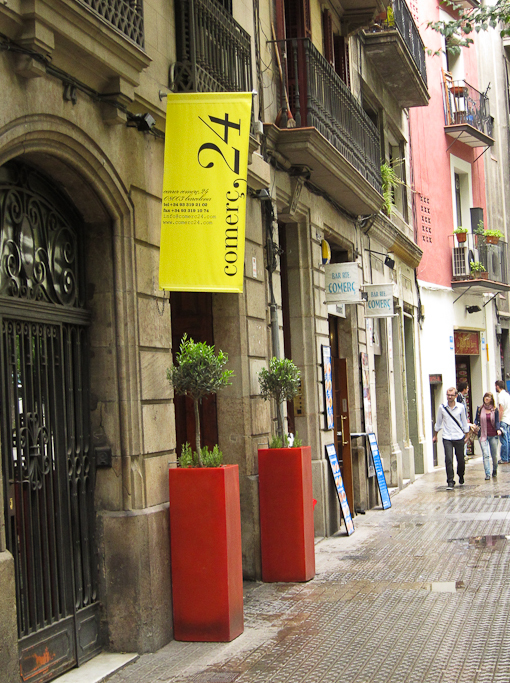 Francesc Macià) and came across this place. 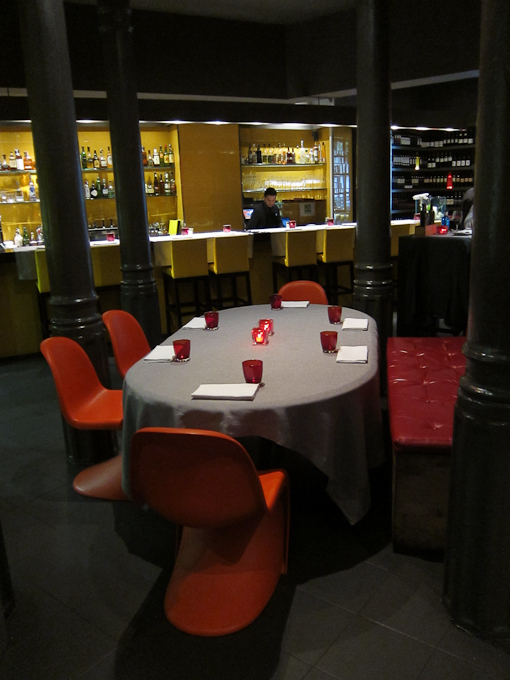 It was around 12ish and it was pretty empty because the Spanish don’t eat lunch until 2:30pm – it is the norm. 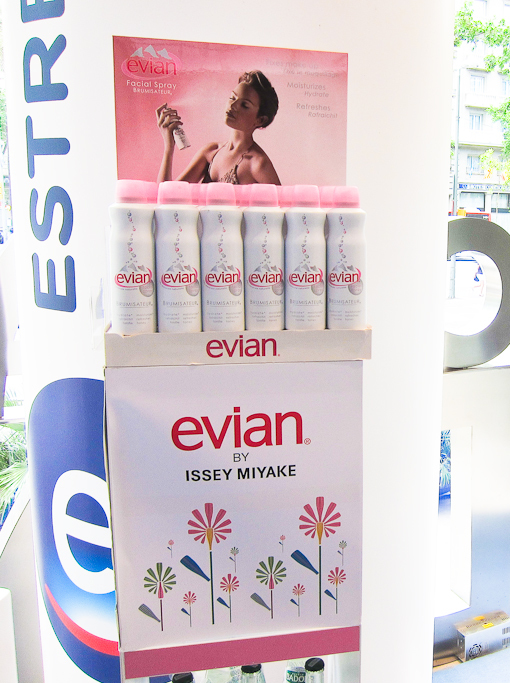 Obviously, it is a place designed to showcase its history, innovation and products. A vintage delivery van was on display – never knew yoghurt was sold or delivered that way. Somehow I expect the Swiss would have something like that. 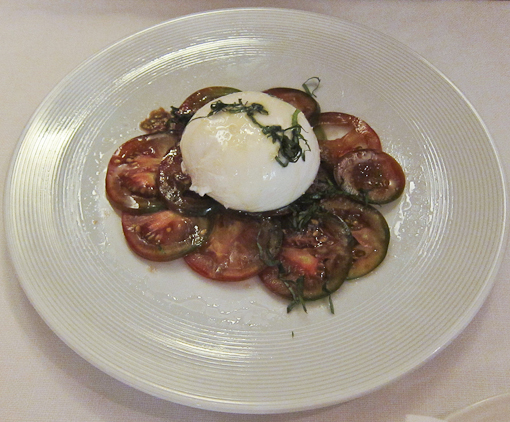 By the look of the white spa-like decor, the food was expected to be light and healthy. It wasn’t that light but tasty it was. We really enjoyed our meal there. 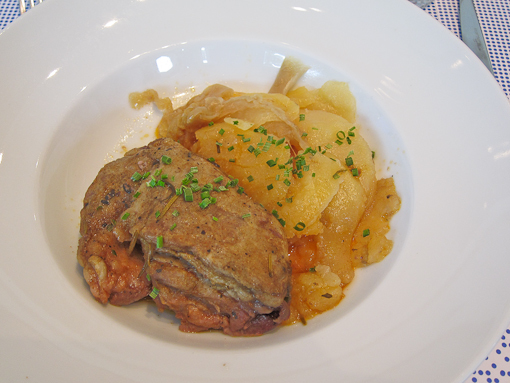 They even had a meat-and-potato dish that suited me. Dessert, of course, was made with yoghurt. But I ate it before taking a picture. 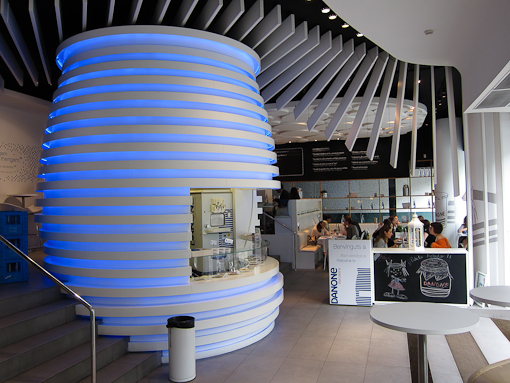 They also sell different kinds of yoghurt (frozen, drinks, etc) with many choices of toppings. Wish they open one near us. 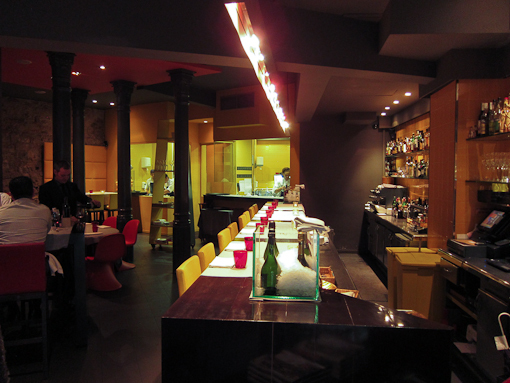 Orio in El Gòtic, Barcelona – it is in the middle of a busy street (C. de Ferran 38), the place looked touristy but it was patronized by locals, the happy hour-after work crowd. 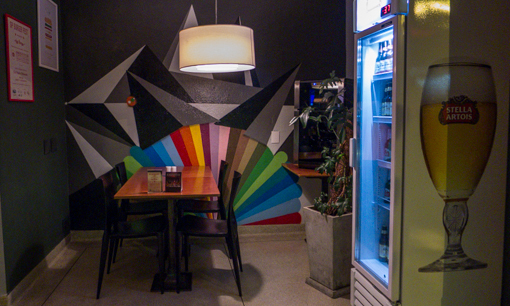 Lively ambiance, a perfect place to mingle and meet people. Two couples, one young and one old, shared the other end of a long table with us. It looked like a meeting for the first time of either the boy or girl to the other’s parents. Too bad we cannot understand what they are talking about. 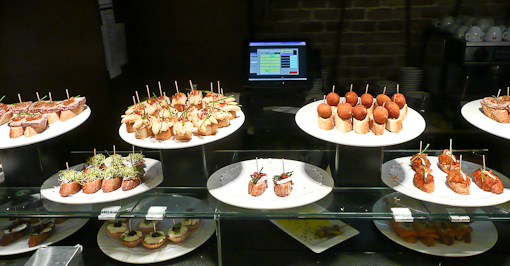 To get the tapas, just go up and help yourself to as much as you want. 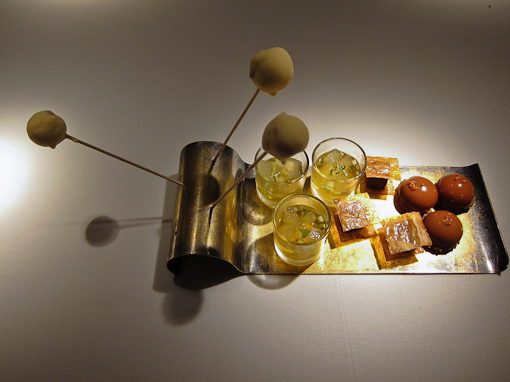 But you are required to keep the toothpick which holds the tapas together, because the restaurant use the number of toothpicks to calculate your bill. Honor system in a restaurant ! 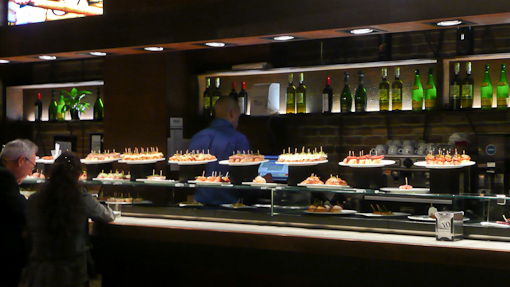 We sat in a section of the restaurant where we could order off a menu and also take the tapas from the bar. 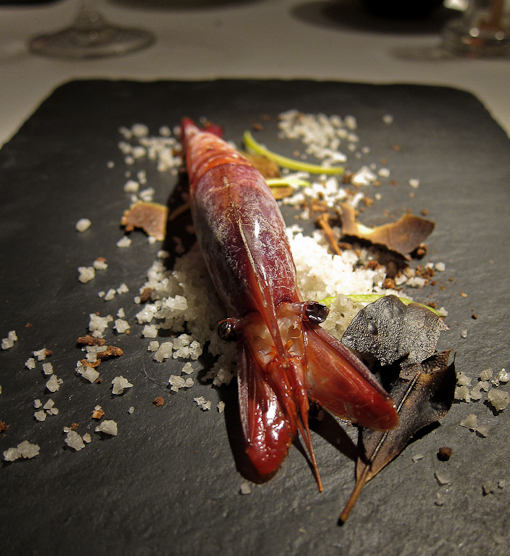 I did not know the place served food from the Basque region until I looked it up online. 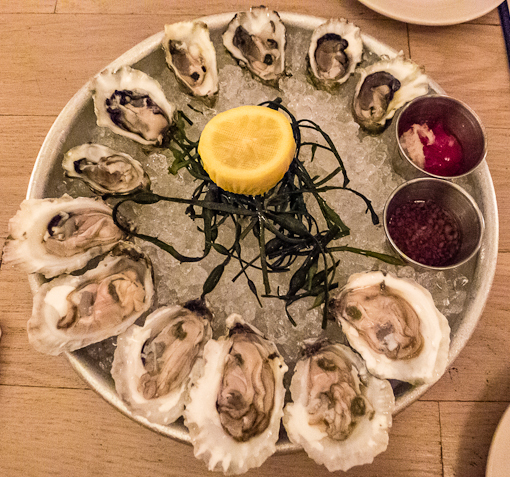 A waiter was shucking oysters at the front of the restaurant – that’s what got our attention. Where available, click on the music link to launch blip.fm in a new window. Press the orange-colored play button near the top to start. While listening, return to the blog by clicking the wordpress window. Sign me up for more Adventures!